Back Row: David Royle, Bob Fairlie, Hugh Farquharson, Geoff Dixon, Peter Ford, Don Hogarth, Paul Royle, Geoff Shephard, Russell Cook, Phillip Amos, Gordon Cook, ? 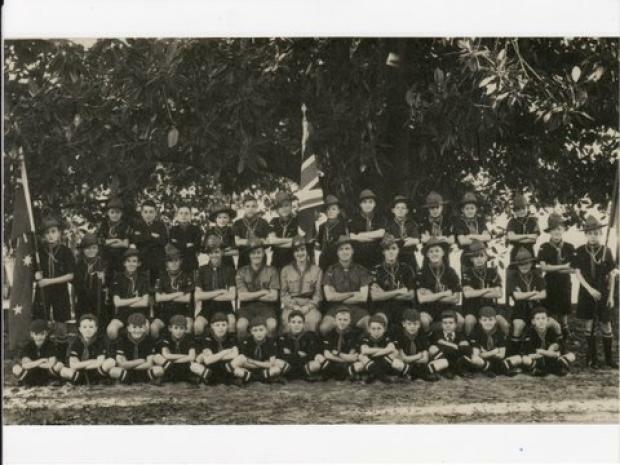 Centre Row: Brian Chappel, Max Greenwood, Ray Hockey, Allan Royle, Barry Dyson, Bruce Watson (Cub Master), Rae Thomas (Assistant Cub Mistress), Des Chadwick (Scout Master), Alf Chappel (Troop Leader), Alan Greenwood, Graham Tibbets, ? , Jim Skinner, Don Anderson.